You have made a groundbreaking discovery in science! The world and your career will never be the same. Oh wait, you need to write your results into a coherent paper and then submit it for peer-review. Shoot… Never fear, for every scientist that dreads or struggles with scientific writing (or those that just want to improve), Stephen B. Heard offers a solution. In his book ‘The Scientist’s Guide to Writing’, Heard offers practical suggestions for almost every aspect of the scientific writing process. Throughout his long career as an evolutionary ecologist, Heard has written and edited hundreds of scientific articles: his own, and those that he has handled as an editor, peer-reviewer, and professor. Needless to say, he knows a thing or two about good scientific writing. He distills his experience to the most important points that every scientific writer should be aware of. The result? 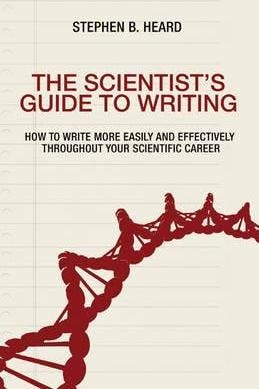 ‘The Scientist’s Guide to Writing’ is an important read for anyone who publishes scientific texts— young scientists will find it particularly helpful. The book starts out with a brief history of scientific writing, and how science progressed from the secretive alchemists of the Middle Ages to the more collaborative 17th century scientists, to the present scientific paper form. Heard stresses the importance of clarity in scientific writing and all of the points and advice that follow hinge on making scientific writing more clear. In between, he peppers the text with many enjoyable quotes and examples from other writers, not necessarily scientific, to help prove his points. You may be reluctant to read a technical book for fear that it would be a snooze. Heard writes beautifully and reading is actually a breeze—it goes similarly to reading a novel. In addition to being extremely well written, the book is impeccably organised. The book is divided into seven parts that are each subdivided into chapters dealing not only with writing, but also with other aspects that are crucial to writing a paper. The book makes a nice read as a whole, but the chapters also stand alone and are easily accessible. So if, after a few years of reading the book, you would like a refresher on how to structure an introduction or how to battle writer’s block, you can easily find the section with relevant information. There is a handy little summary at the end of each chapter, which contains the most salient points and is also useful to refer to. Heard also includes exercise ideas to practice the theory covered in the chapter. The book doesn’t just tackle the actual writing part but also important, related points, such as writing behaviour. Heard offers many useful suggestions on how to modify behaviour to get started on a writing project and keep up momentum. These aspects are underrated but are definitely important parts of the writing process that all writers go through. At first I was surprised at how short the sections dealing with the different parts of a scientific paper are, but Heard manages to include the generally most important points. The wide range of topics that he covers is only a benefit to the reader. He also explains the peer-review process in length, how to respond to reviews, and tips for writing as a non-native English speaker. Yes, he covers a lot in this book! Although he is a biologist, Heard has taken care to make the book applicable to all scientific fields and specifies where expectations in certain fields may vary. He also uses examples from a variety of different fields, such as astronomy, to illustrate his points. Chemists, physicists, mathematicians, and other scientists would find this book useful to improve writing. Indeed, his examples are very clear and help the reader to understand how some writing choices can really aid clarity and flow. If you are a scientist, you have probably struggled through reading scientific papers that are too dense, riddled with grammatical mistakes, poorly organised, or just plain confusing. Heard emphasizes that you can keep the complexity of scientific texts and offers ways to write that readers can better understand. Scientific writing is underrated but crucial as it is the vehicle through which findings are communicated. If only everyone could read this book, it would make science so much easier to understand!